The Cappadocia region of central Turkey, home to Christian communities since the second century, includes dozens of churches carved inside the area’s unique volcanic rock formations. 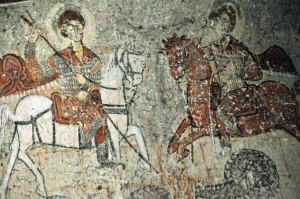 An eleventh century fresco in one church honored St. George, a favorite son, and originated an iconic image seen in churches around the world. St. George was apparently born in about 275 A.D. in Lydda, Palestine, where his Cappadocian father had met his mother while serving in the Roman army. 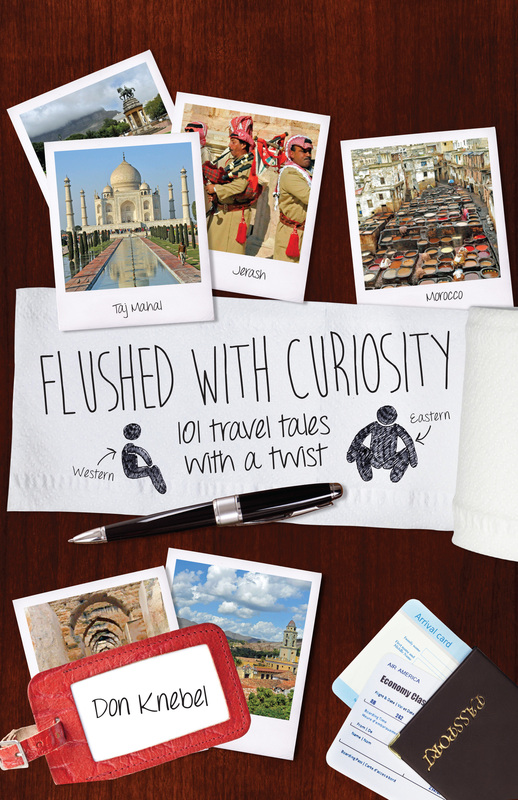 George, raised a Christian, became an officer in the military guard of Emperor Diocletian. In 303, Diocletian ordered his officers to repudiate Christianity or face death. When George refused to renounce his beliefs, he was tortured and then beheaded. Emperor Constantine, who legalized Christianity in 312, reportedly ordered a church built in Lydda to honor George, who became a saint in 494. Over time, St. George became associated with a medieval legend in which a maiden-devouring dragon terrorized a pagan village. As the story went, George slew the dragon and the grateful villagers all converted to Christianity. In the eleventh century, numerous Byzantine churches were built within the soft, cone-shaped rocks of Cappadocia. Frescoes, still colorful because of the absence of direct sunlight, decorated many of them. One fresco on a curved wall in the so-called “Snake Church” (Yılanlı Kilise) honors St. George, whose father was raised nearby. The fresco portrays a haloed and armored George, sitting astride a festooned white horse and gouging a snakelike dragon with his lance. 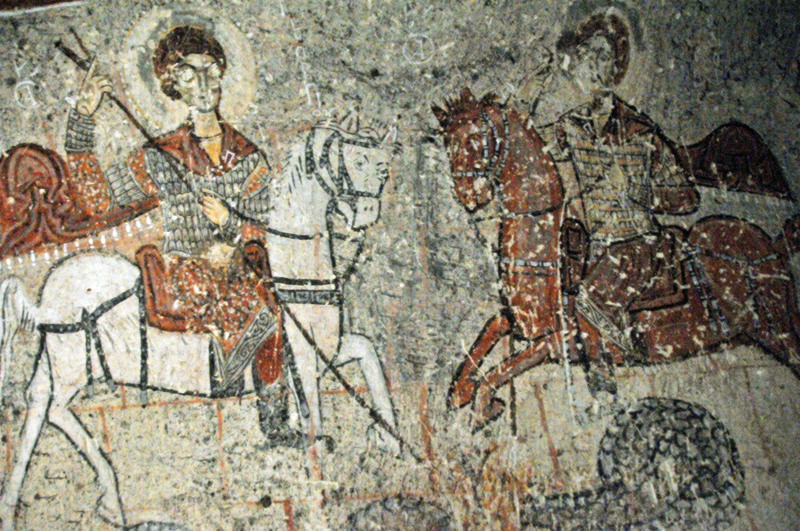 St. George is accompanied in the fresco, perhaps the earliest illustration of the legend, by St. Theodore of Amasea, a less well-known Christian martyr also associated with dragon slaying. Crusaders passing through Cappadocia took the story of St. George and the dragon back to Europe, with the dragon often assumed to represent Satan. The image in Cappadocia’s Snake Church of a battle-bedecked St. George, atop a white horse and killing a dragon with a lance, inspired countless imitations and became a familiar icon in Eastern Orthodox and Roman Catholic churches. The Göreme Open Air Museum, which includes the Snake Church, became a UNESCO World Heritage site in 1984.